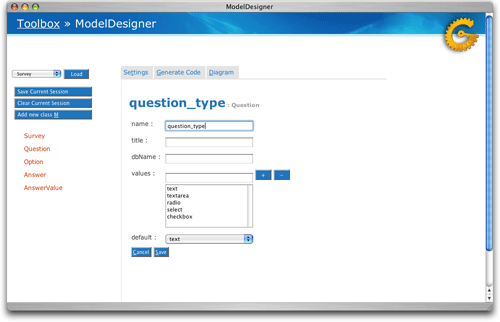 ModelDesigner is a code generation tool for SQLObject models. 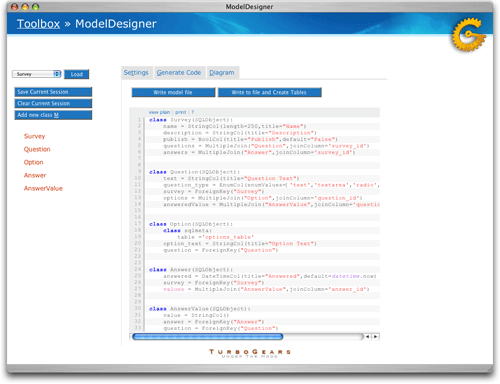 It allows you to describe your models through the web in a context-aware environment rather than forcing you to code your models by hand. 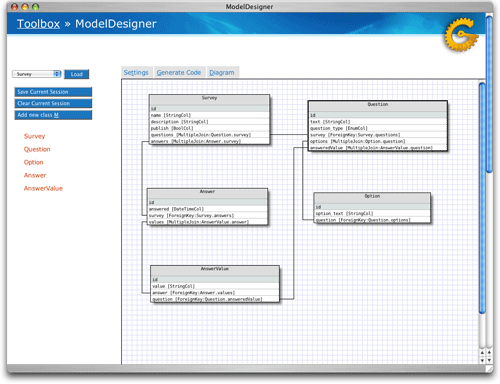 ModelDesigner also provides a convenient diagram view so that you can get a high level overview of your model as you design it. When you’re happy with your model, ModelDesigner will generate the SQLObject code for the model and optionally generate your database tables. Note: If you start toolbox from the same directory as last time, your last session is displayed as “Existing Designer Session”. It gets saved in that directory as model_designer.tmp. If you want to add it as a sample, save it as YourModel.js in the session directory of the designer.